NASHVILLE, Tenn. (September 2013) – Members of Delta Gamma Sorority at the University of Memphis are changing the lives of blind and visually impaired golfers around the world. A telephone campaign by coeds volunteering their time helped the United States Blind Golf Association single-handedly land 177 new partners, making it more possible to stage national and regional tournaments, junior golf clinics, and Hall of Fame inductions for blind athletes. "It is the first time a university-based organization has volunteered to support the USBGA," said Survey Chair Diane Wilson, 2013 USBGA Ladies Division National Champion. Former USBGA President David Meador noted that the "high-flying" results occurred when the coeds manned phones between classes during a very busy week in April. Thanks to their efforts, the organization has boosted its mailing list for the Midnight Golfer Partners Quarterly newsletter, while landing national exposure and resources. The newsletter tells the organization's story with heartfelt articles and photos about the world of blind golf. "We are very proud of what Delta Gamma has done," Meador added. "Their philanthropic work brought unprecedented support -- a life-changing development for our members, as well as other aspiring blind golfers across the United States, Canada and Europe." 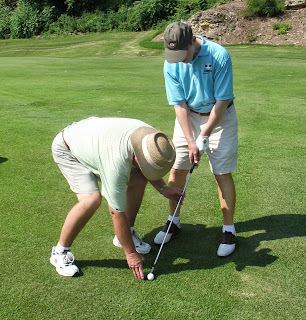 The United States Blind Golf Association was founded in 1953 by blind golfer and lawyer Bob Allman. Today, the 501(c)3 organization conducts three annual tournaments and holds more than a dozen clinics for blind and vision-impaired children through its junior blind golf program. The USBGA also has a Hall of Fame that honors legendary players and contributing organizations. "Every place we go, people tell us they had no idea blind people could play golf," said USBGA President Jim Baker of Hermitage, Tenn. "Playing national and international championships gives us the great opportunity to break stereotypes and demonstrate the power of partnership and doing what most might consider impossible. To make participation in the blind golf tournaments possible, the organizing committee has to raise more than $40,000 annually from businesses, organizations and individuals. The funds pay for the players' green fees, lodging, and meals. "Yes, we're about golf, but what we're really about is demonstrating for adults and children alike that absolutely nothing's impossible through partnership," Meador noted. For more information about the USBGA National Championship tournament or to sign up to receive the Midnight Golfer Partners Quarterly newsletter, call (615) 385-0784, send an email inquiry to davidmeador7@gmail.com, or visit http://www.USBlindGolf.com.